Jeep vehicles are synonymous with off-roading. Make your Jeep's off road performance even better by installing a suspension lift from Tuff Country. Offering leaf spring kits for CJ5, CJ7 and early Wrangler models which feature the EZ-Ride ride quality. Also coil spring kit for Jeep Cherokee and late model Wrangler. All made to fit just right. The Jeep Cherokee was introduced in 1984. Built with dirt in mind, this mid-size suv has been extremely popular with off-roader all over the country. While production of the vehicle stopped in 1991 it is still very popular today. It's simple suspension design makes it an ideal vehicle to lift. 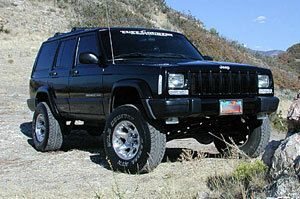 Jeep Cherokee suspension lift kits come in multiple styles and configurations. Built in 1992 as an upscale version of the popular Cherokee models, the Grand Cherokee is no slouch when it comes to off-road. Early versions off the Grand Cherokee had a suspension very similar to the Jeep Wrangler. While the Grand Cherokee has evolved into a more refined vehicle over the years many Grand Cherokee lift options are available. The successor to the famous CJ line of Jeeps, the Wrangler has built a name for its self since its introduction in 1987. A beast off-road, this Jeep is what others measure up to. Originally equipped with leaf springs front and rear until 1997 when Jeep switched to a coil spring suspension. Lift kits for the Jeep Wrangler range from 1.5 inches to 4 inches of lift. The CJ family of Jeeps originated from the 1944 Willys military Jeep. In 1955 the first CJ5 Jeeps where produced. 1976 saw the introduction of the longer wheel based CJ7. Both the Jeep CJ5 / CJ7 have a huge following of diehard off-road enthusiasts. Easy to work on and customize these Jeeps are still popular today. Using a simple leaf spring suspension Jeep CJ5 / CJ7 suspension lifts are affordable and simple to install.